Line Station Tivat – on Airport “Tivat” and Airport “Podgorica” in Montenegro. 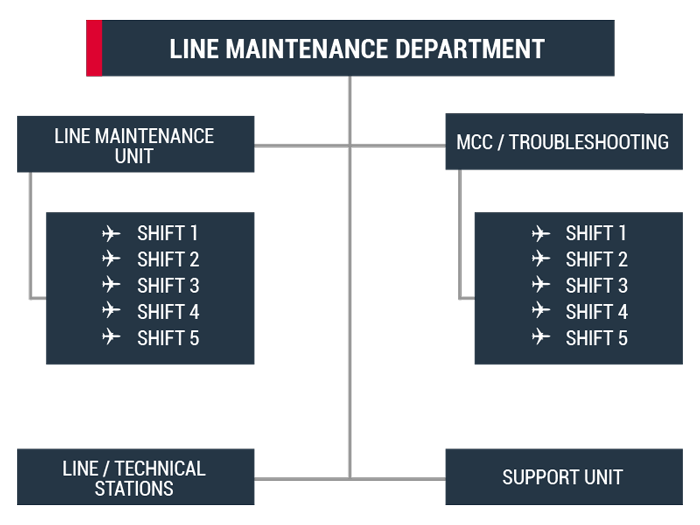 Maintenance Control Center /Troubleshooting Department is a point of contact for all line maintenance requests and connection to other Jat Tehnika resources that could be needed during line maintenance process (various back shops – component shops, engine shop, NDT, structural/composite shops) – and it is available 7/24 – please find contact details on Contact page. Line Maintenance – Belgrade main base – uses one line/position in Hangar H1, two positions in Hangar H2 and aircraft parking platform in front of both hangars. Line Maintenance Department utilizes labor arrangement scheme to cover 24 hours per day / 7 days per week / 365 days per year. It is organized in several units and shift work pattern is used. Jat Tehnika Line Maintenance provides complete line maintenance to Air Serbia- Serbian national flag carrier- as a part of long term total support contract. At Belgrade airport line maintenance services are provided through standard SGHA agreements with: Aeroflot, Austrian Airlines, Czech Airlines, Lufthansa, Qatar Airways, Fly Dubai, Norwegian Air Shuttle, Aerosvit Airlines and at Line Maintenance Stations in Tivat and Podgorica airports with: Rossia Airlines, Siberia Airlines, Globus, Ukraine International Airlines and Aeroflot among others.